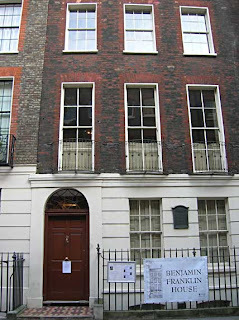 So, I promised a post on Benjamin Franklin's house, and here it is. 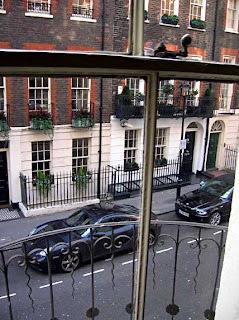 I was very excited about this house, situated in a narrow street close to Charing Cross Station, because, amazingly, it's the only surviving Franklin residence (he rented it, rather than owned it, but said he'd spent some of the happiest years of his life there). Between 1757 and 1775 he shared it with his widowed landlady, Margaret Stevenson, and her daughter Polly. In 1913, there were red faces at the London Council Housing Division when they discovered they'd mounted Franklin's wall plaque on the wrong house in Craven Street; the correct one was two doors up from Craven Lane - now Craven Passage - and the plaque was moved from no.7 to no.36 (see above and below for pix of our approach). 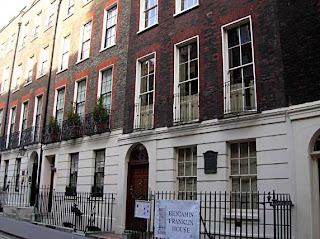 In many ways this was the opposite of our experience at The Foundling Museum because there is really nothing left from the period except the house itself (built circa 1730 - and even then, the building was remodelled slightly in the Regency period). The guide told us it was the Empire Hotel in the 19th century, then became derelict, narrowly escaping destruction during World War II when a bomb fell into the back courtyard. Luckily it failed to explode. 'Polly' works to a script which is cleverly interleaved with sound effects and recorded speech (it really felt like going back in time, following this woman down a dark corridor, a babble of voices coming from behind the door). 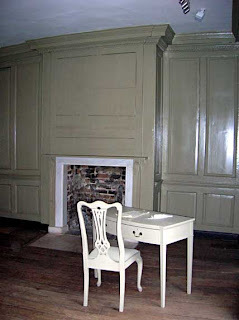 The blank walls are used to project imagery and quotations from Franklin's works (Peter Coyote is the voice of Franklin while Imelda Staunton is Margaret Stevenson). It's very effective, though it goes at quite a pace. 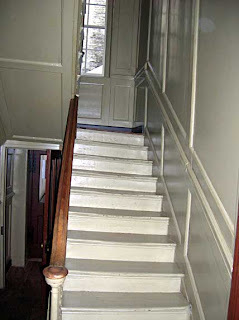 You can see Franklin's writing table in the picture above, and below is the balcony. It seems that Franklin took 'air baths' in his room every day. He said: 'I rise early almost every morning and sit in my chamber, without any clothes whatever, half an hour or an hour, according to the season, either reading or writing.' 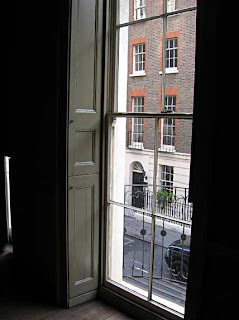 He apparently sat naked in front of the open windows of his second-floor parlour (above). Imagine what the neighbours made of it! See below for a short tour of the room I was just talking about. After the essential browse in the shop afterwards I picked up a curious book called Benjamin Franklin Book of Recipes by Hilaire Dubourcq which combines recipes of the day with dishes of Franklin's invention and quotes from his writings. There's some entertaining stuff about his vegetarianism, among other things. Describing his decision to eat fish again, he explained: 'but when this [fish] came hot out of the frying-pan, it smelt admirably well. I balan'd some time between Principle and Inclination; till I recollected, that when Fish were opened, I saw smaller Fish taken out of their Stomachs. Then thought I, if you eat one another, I don't see why we mayn't eat you. So I din't upon Cod very heartily... So convenient a thing it is to be a reasonable creature, since it enables one to find or make a Reason for every thing one has a Mind to do'. Add gin to the warmed ale. Stir in sugar and nutmeg. Serve. Thank you! What an interesting post, and I'm amazed that that's the only remaining Franklin house. Thanks for the video and the photos too. It looks like a beautiful building! Thanks Eliza - glad you enjoyed it! I think it's a miracle that the place has remained intact through World War II etc.